The copyrighted 2016, released 2017 American Red Cross Lifeguarding Instructor’s Manual does not reference which page in the participants manual (American Red Cross Lifeguarding Manual) the material the instructor is lecturing about. It only references chapter numbers. In the waterfront lifeguard training section it does not even give chapters and the lecture skips around many different participant manual pages. The copyrighted 2016, released 2017 American Red Cross Lifeguarding Manual does not reference skills sheet page numbers at the pages about each subject. To make it easier/faster for my classes to find the Red Cross Lifeguarding Manual skills sheets and in some cases, to make the skills easier to do, I ask them write page numbers/notes at many pages. For longer notes they can print the write in your Red Cross Lifeguarding Manual webpage, cut out paragraphs and paste them into their participant’s manual. I would like to suggest that instructors also write the notes at write in your Red Cross Lifeguarding Manual in their copies of the American Red Cross Lifeguarding Manual. Note the “You might find it easier” references for some of the skills. Some, but not all, of the suggestions for the participants manual are referenced at this page. In the instructor’s manual, each page has a series of boxes. I write the participants manual page number in the long, narrow column to the left of the section I am lecturing from so I can send people to that page during the lecture. I suggest you cross reference these as you write them in, in case you disagree with what page should be referenced. I also included items worth mentioning, many of which are quotes from the copyrighted 2016, issued 2017, First Aid for Public Safety Personnel (California Title 22) lectures. As I read the First Aid for Public Safety Personnel Instructor’s Manual Supplement I noticed things first aid and lifeguard students had had questions about. Some other notes are to help students better understand things that previous students have been confused about, or just links to info not covered in a lifeguarding manual that previous students have appreciated knowing about. Safety notes: since the backboard can be accidentally dropped during any extrication, it can be wise to warn the lifeguard candidate being a “victim” to lift their head slightly off the backboard as they are being pulled out, since if they have their head on the board and it is dropped, it can hurt a lot. Whenever the class will be swimming to depth, it can be wise to remind them and lead them through how to equalize the pressure in their ears before they try each deep water skill. It is worth mentioning during your lecture on consent, that the emergency medical assistance for a minor (under age 18) without a parent/guardian to be found, is implied, BUT it must be for a life-threatening problem, not just a small scrape. Just because someone is a friend or relative, consent is not implied for them. Page 72 at the top, perhaps there is a typographical error. Make the following correction, where it says “you do not need to have the class complete all three,” change it from “all three” to “both”. The Red Cross and YMCA of the USA issued a joint statement in May, 2015 that said, in part, swimmers should limit themselves to “a single inhalation” whenever they hold their breath and submerge. News releases on the subject and more details can be found at Swim Class Safety Rules, required reading for all my swim students. Scroll down to Hypoxic Training. Page 93, second box, write: 67 and make a change where it says “refer participants to Table 3-2,” Change 3-2 to 3-3. Page 94, at the top write: this is almost, but not quite, an exact copy of chart 3-3 on page 67 and 68. (Hmmm, did you notice what we suggested writing in the participant’s manual about the way we were originally taught to do Passive Victim Front Rescue? The last boxes (‘switches to a towing position’) should not be there at all. and make a note: Kevlar gloves are puncture resistant. Nitrile gloves are resistant to most moderate chemicals. If you must use latex, touch victim as little as possible until you know if they are allergic to latex. Page 203 Bloodborne pathogens does not cover ebola. and make a note that Hepatitis B virus can live on a surface, exposed to the air and dried, for two weeks. Never pour undiluted bleach straight from the bottle onto spills of blood, urine, sputum or vomit. Dangerous levels of toxic chlorine nitrous oxide gases could result. next to the Science Note, write: shout-tap-pinch is not mentioned in the student manual. Shout-tap-shout is on page 213. It could be worth mentioning to students that unconsciousness and being asleep are not the same. Also, you can be awake and only partially conscious. note that we ask instructor candidates to write in their manual on page 281, below figure 9-6, write: dripping wet lifeguards need to dry off before they drip on the victim’s chest, or a dry lifeguard not involved in the water rescue needs to attach the pads and operate the AED. Plus, these are painful when applied! On the same page in the student manual about shock, (314), hemostatic dressings are mentioned. It could be worthwhile to tell students that to stay effective, hemostatic dressings require continuous direct pressure at the source of the bleeding until controlled. Ticks: If a student asks about removing a tick: apply fingernail polish, alcohol, a hot match, petroleum jelly, lotions or other potions. NO, they do not work and they increase the risk that the tick will salivate or regurgitate into you and increase infection. It could be worthwhile to tell your lifeguard candidates that if part of a bone is protruding through the skin, do not attempt to align/straighten the bone or place the bone(s) back into the body. Page 367, step 10 It can be easier during the pull/push of the backboard onto the deck if you try to get the board as horizontal as possible as soon as possible, rather than trying to push/pull it at an angle. It can also be easier, especially with a heavy victim, to slide the board up onto the deck about 60% of the way, then let it down onto the deck and then slide it the rest of the way flat along the deck, instead of lifting the entire weight of the board and victim for the entire distance. Page 367 end of step 7, 369 end of step 6 and 371 end of step 7 write: Some head immobilizers will not attach to the backboard Velcro unless hair is moved out of the way. To do this you will need to put on one head immobilizer at a time as you sweep the hair out of the way. Page 367 step 7 (last photo on page 366) write: Most (but not all) CJ1000 Spine Boards (for example) have the strap with sticky Velcro on the left side of the backboard (left side as referenced to the victim’s left side of their body) and the soft Velcro strip on the right side. If you rescue the spinal injury victim by approaching their right side you will be in a position when you get to step 7 to be able to reach across the backboard and grab the sticky Velcro strap, pulling it tight across the victim, and holding them in place sooner/better, then putting the soft Velcro strap across on top of the first strap you are still pulling on/holding the victim in place with. In the photo below, the black strap has the sticky sided Velcro, the white strap has the soft sided Velcro strip. 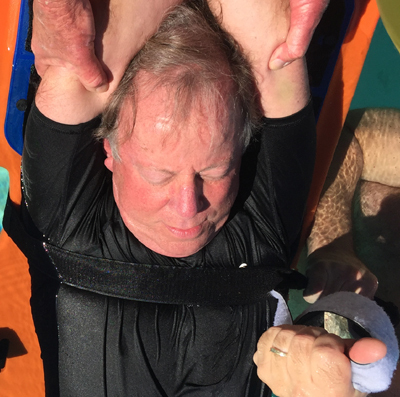 You can see the lifeguard’s right hand holding the end of the sticky Velcro strap tightly across the victim’s body, and the lifeguard’s left hand holding the end of the soft Velcro strap, about to place it across and on top of the sticky Velcro strap. It could be wise to try this from each side of the backboards you use for training/rescues at your facility and see for yourself if you have better control/stability. If you are using a plastic backboard with separate strap(s) in a Spider Strap configuration, please note that the Spider Strap will float around and the extra ends you are not using can really get in the way, so you should consider replacing the Spider Strap with one strap designed for your model of backboard. All this is also applicable to page 368 step 5. Page 369, step 8 It can be easier during the pull/push of the backboard onto the deck if you try to get the board as horizontal as possible as soon as possible, rather than trying to push/pull it at an angle. It can also be easier, especially with a heavy victim, to slide the board up onto the deck about 60% of the way, then let it down onto the deck and then slide it the rest of the way flat along the deck, instead of lifting the entire weight of the board and victim for the entire distance. While on patrol along the beach at Garden Key on the afternoon of December 18th, ranger Tim Morrison discovered a stainless steel object approximately four inches long lying in the sand. Initial examination indicated that the object was possibly the nozzle to an air compressor hose. Morrison placed the object in his pants pocket and continued working the rest of his shift. Later that evening, he removed the object from his pocket to re-examine it. After looking it over, he set it down on a table, at which point it detonated. The discharge of what was later determined to be a .357 caliber round severely injured his right index finger and caused powder burns to his face. The Coast Guard was notified and airlifted Morrison to Key West Hospital at about 3:30 a.m. After several hours of surgery, doctors where able to clean and close the wound. A day later, Morrison was released by the hospital. Investigation revealed that the object was the end of a device used by scuba divers called a “bang stick.” In this case, it was made of stainless steel. The bang stick broke down into two parts by unscrewing it. Inside one part was a firing pin and spring; inside the other was the an empty casing to a .357 magnum round. The bullet embedded in the ceiling of Morrison’s quarters at Fort Jefferson. It only takes approximately two pounds of pressure to set one off and is usually used in conjunction with a long rod or stick. The device, when not attached to a stick, looks very benign. Morrison hopes this information prevents such an unfortunate incident from happening to anyone else. and perhaps mention to students: when looking from the surface to the bottom in a quick search immediately after someone is missing, or when searching where there are many waterweeds, or murky water, you should not necessarily have in mind to look for the full shape of a body lying on the bottom. On light colored sand a light skinned person might not be that visible, but their dark swimsuit or dark hair could be, or vice-versa dark skin and a yellow bathing suit, for example. It could be wise to have swimmers wear yellow/bright pink/lime green/white swim caps like they do at open water triathlons. Puleeeeease go to the new Instructor’s Corner and look for the corrections they posted shortly after the release of the new lifeguarding program. Lifeguard Training FAQS has advice on how to pass the prerequisite swim tests that you could pass on to potential students. – – – I give this advice at the start of the class about waterproof sunscreen. A sun protection factor (SPF) of 15 means you can supposedly stay in the sun 15 times as long as without using it, but it rarely works that well. If you are worried about getting too much sun you should be using sunscreen of 30 or even 60 regularly, not just at the pool. Read the instructions, do they say you have to wait 30 minutes after applying the sunscreen before you can get in the pool? (Most kinds will wash right off and just make an oil slick in the pool if you apply them right before getting in). I use a brand that allows me to get in the pool right away. Test a little before you use any extensively; some people are allergic to some kinds. How to pass a Red Cross test has the advice I give my students before an exam. Some of these are designed for an in-service training project, or just as additional training resources. See Enforcing Rules, page 93 and Communication with Patrons and a list of rules on page 92 of the Lifeguarding Manual. Preventative Lifeguarding has notes from various staff manuals, personal experiences and the Red Cross texts. It includes UNSAFE PRACTICES or potential problems TO WATCH FOR, areas where most accidents occur, accident prevention tips that USA Swimming coaches know and suggested disciplinary action for minor and major infractions. CPO What a certified pool operator (CPO) knows that lifeguards and swimmers should know. CEUs are available for your students who complete a Red Cross lifeguard training course.